There's nothing quite as magical as the feeling of the fresh sea breeze as you walk down the beach. 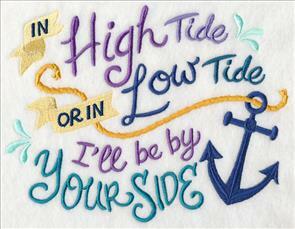 Stitch songs of the sea with this week's nautical designs! 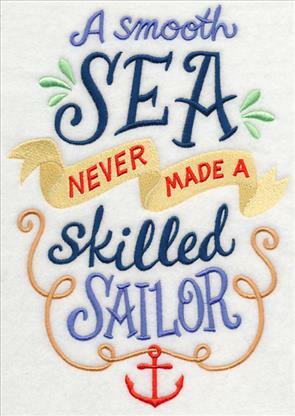 Add the spirit of the ocean to tea towels, pillows, and framed art with new maritime quotes and sayings. 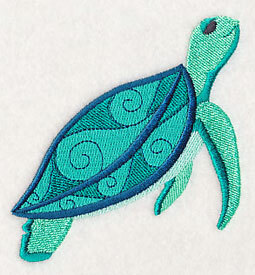 Under the sea potpourri bring sea turtles and tropical fish to beach bags and apparel, while deep sea dwellers bring a whole new look to your next project. 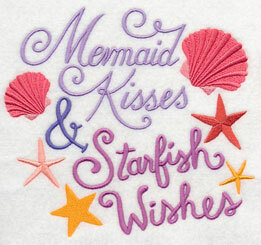 Scroll down the page to see these ocean-inspired designs! Adorn your patio with a nautical pillow! 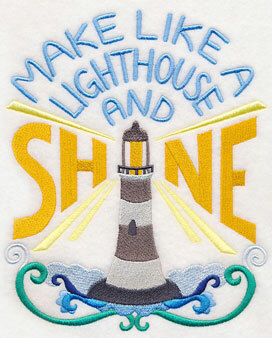 Stitch majesty of the ocean with seaworthy sayings and samplers. 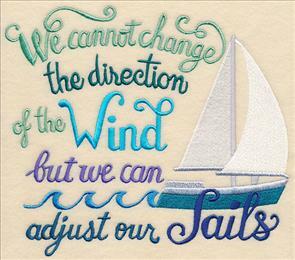 Add an inspiring quote to a cushion or tote bag, or adorn a pillow or wall hanging with a sweet, romantic motif. 7.81" x 7.76" and 6.96" x 6.91"
7.79" x 6.86" and 6.66" x 5.86"
5.52" x 4.86" and 3.87" x 3.40"
Showcase your love for the sea and its magnificent creatures with these bright and colorful embroidery designs. 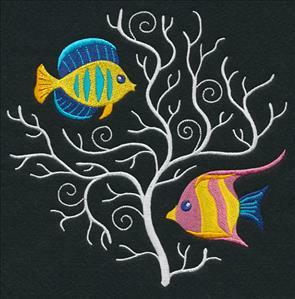 Terrific as framed artwork or wall hangings for unique ocean art. 9.76" x 6.91" and 9.41" x 5.89"
7.81" x 4.89" and 6.87" x 4.30"
7.58" x 6.91" and 6.43" x 5.86"
5.33" x 4.86" and 3.86" x 3.52"
Let one of these lighthouse designs shine on your next embroidery project! 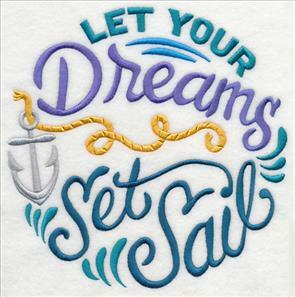 The nautical motifs are a marvelous way to add the grandeur of the coast to quilt blocks, tote bags, and pillows. 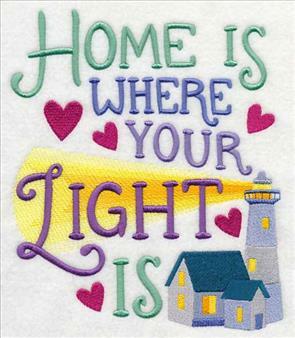 6.86" x 7.79" and 5.87" x 6.65"
6.91" x 8.37" and 6.29" x 7.61"
5.61" x 6.79" and 4.86" x 5.88"
Framing your embroidery is a gorgeous way to showcase your favorite designs. 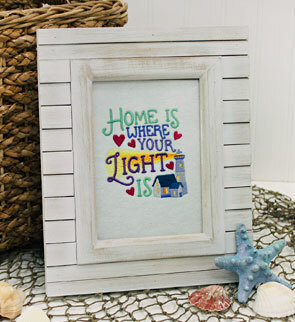 This beach-theme frame and ocean accents match the beauty of the lighthouse design perfectly. 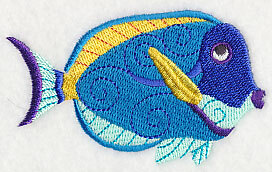 Get more information about framing embroidery in this helpful tutorial. 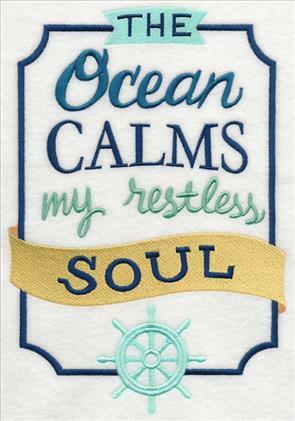 The open sea calls to many -- embrace your wandering spirit with these heartwarming and inspiring sayings. 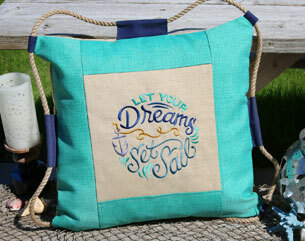 Great on beach bags, pillow shams, and more. 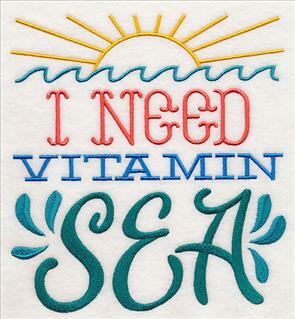 5.37" x 7.80" and 4.72" x 6.85"
Friendly sea sayings are a brilliant way to stitch for your favorite sailors. 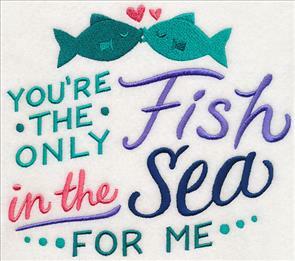 Bright colors, ocean-theme accents, and fun fonts give these designs a unique style. 6.91" x 7.42" and 5.86" x 6.29"
4.85" x 5.22" and 3.59" x 3.87"
Each of these songs of the sea capture the wonder of the ocean waves. 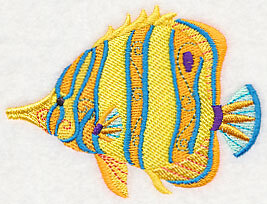 Add to pillows, tea towels, quilts, and more to bring the seashore to your embroidery projects. 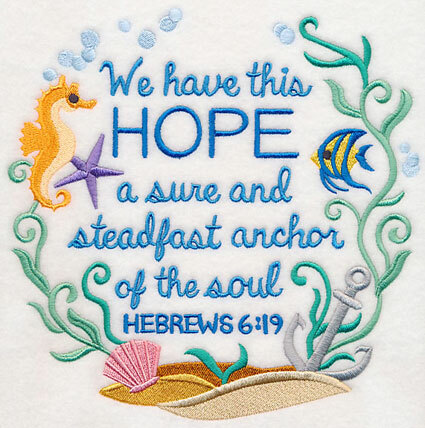 8.98" x 6.90" and 7.66" x 5.86" and 6.35" x 4.86"
Several Bible verses feature the ocean, and these faithful designs showcase their beauty. 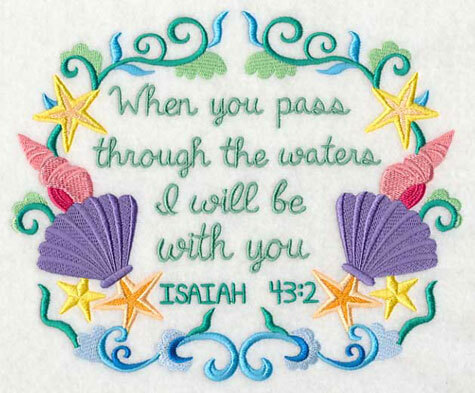 Stitch on decor items to share His word in your home. 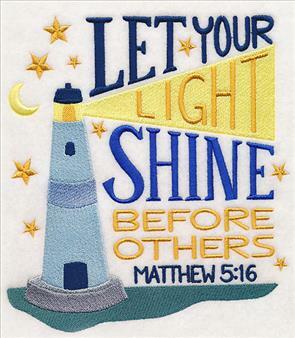 6.90" x 10.48" and 5.85" x 8.88"
5.14" x 7.80" and 4.53" x 6.87"
Uplifting, praiseful sayings bring a sense of calm to any roaring seas. 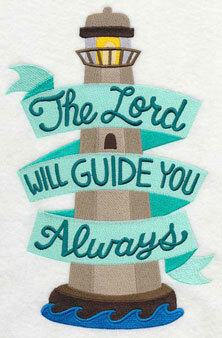 Bible covers, wall hangings, quilts, and more will get an inspiring look thanks to this hopeful design. 7.81" x 7.75" and 6.96" x 6.91" and 5.90" x 5.86" and 4.89" x 4.85"
This colorful quote design is just as motivating as it is faithful. Brilliant as framed artwork, or stitched on a pillow! 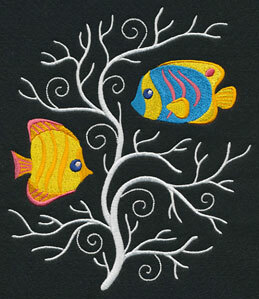 8.40" x 6.91" and 7.71" x 6.35" and 7.14" x 5.87" and 5.91" x 4.86"
Colorful, brilliant tropical fish pop against the cool, black background of these designs; whitework coral makes a striking combination. Great on tote bags, pillows, and more. 7.82" x 7.67" and 6.99" x 6.85"
6.61" x 7.81" and 5.86" x 6.93" and 4.86" x 5.74"
Sail off to sea with the turtles found in this potpourri of ocean-worthy designs. 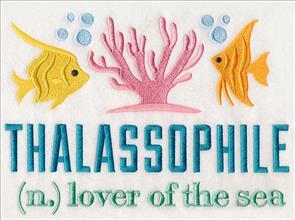 The whimsical sea creatures are fabulous on tea towels, quilts, beach gear, and more. 6.92" x 9.39" and 5.87" x 7.96"
6.49" x 11.76" and 5.19" x 9.40"
4.30" x 7.80" and 3.79" x 6.87"
A tea towel gets a breath of fresh, ocean air when adorned with this sea turtle. 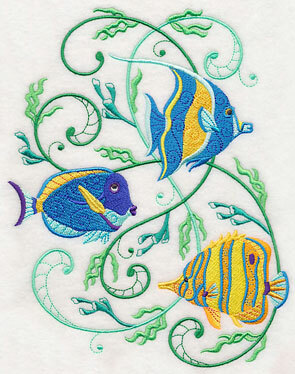 The light, open areas of this design make it the perfect choice for embroidering on smooth, low-nap towels. Get more information (including an awesome video!) 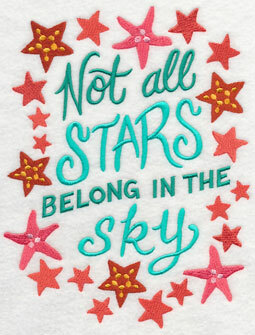 on embroidering on tea towels in this written tutorial. 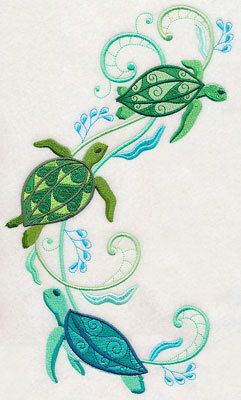 Each of these graceful designs are ready to add sun and surf to your summer stitching. Use to brighten a beach towel, or update a swimsuit cover-up. 11.75" x 4.64" and 9.40" x 3.71" and 7.80" x 3.08" and 6.00" x 2.58"
A corner design is just the right fit for pockets and napkins. 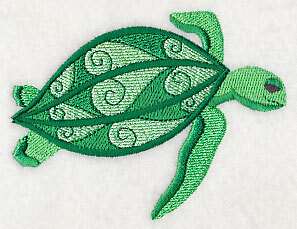 A single sea turtle shines on a wide variety of projects! 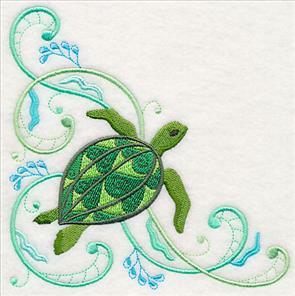 3.84" x 2.92" and 2.49" x 1.88"
Two more turtles have been separated from the fanciful designs, and are ready to adorn your next project. 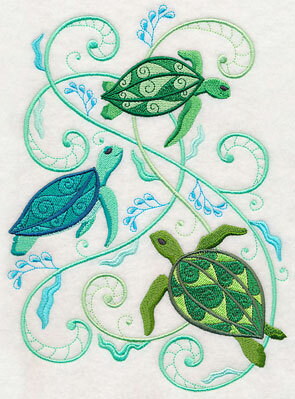 3.87" x 3.69" and 2.49" x 2.38"
Stitch this potpourri of sea turtles on garments, tote bags, cushions, and more. 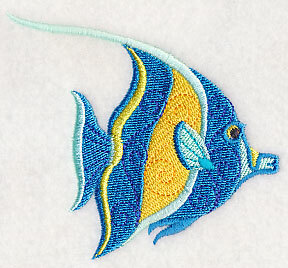 Md - Designs smaller than 7.9" 7.9"
Embroider the natural wonders of the ocean, such as these tropical fish, on your next embroidery project. 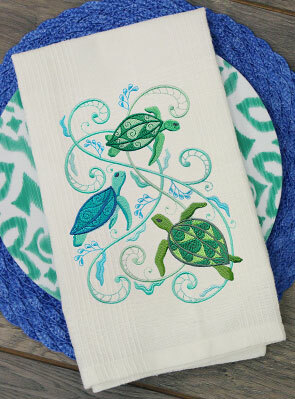 A terrific way to brighten beach towels and totes. 6.91" x 8.78" and 6.14" x 7.81"
6.31" x 11.76" and 5.05" x 9.41"
4.19" x 7.81" and 3.69" x 6.87"
Two tropical fish add color and whimsy to placemats, pillows, and wall hangings with this border design. Seaweed and other deep sea plants add extra ocean appeal. 11.73" x 4.59" and 9.39" x 3.67" and 7.79" x 3.05" and 6.00" x 2.35"
Show your love for the sea with a coordinating corner design, and individual fish. 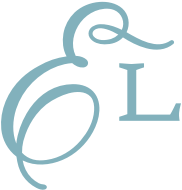 Pretty on shirts, beach bags, towels, cover-ups, and more. 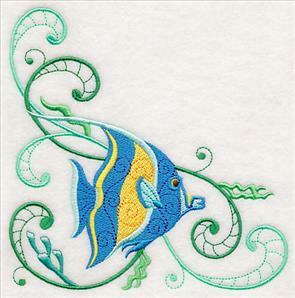 3.84" x 3.45" and 2.51" x 2.25"
Bring the beauty of the ocean to your embroidery projects by adding these fish designs to pillow covers, tote bags, and towels. 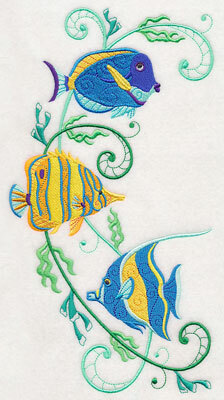 3.58" x 2.66" and 2.34" x 1.74"
Add these tropical fish designs to beach bags, towels, apparel, and more. 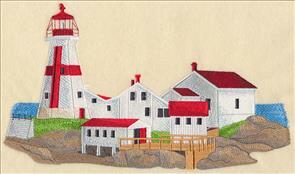 Wendy wrote in wondering if we could create the East Quoddy Lighthouse on Campobello Island to stitch alongside the West Quoddy Lighthouse in Maine. Here a realistic design of the light (and sketch version, too!) 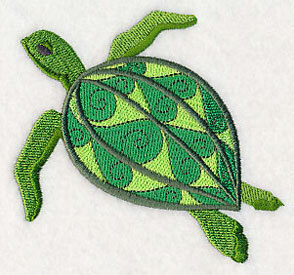 are ready to adorn quilts, pillows, and more. 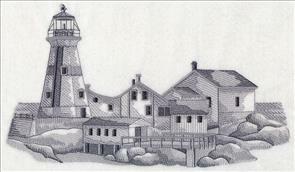 Find even more lighthouse designs here! 11.74" x 6.78" and 9.40" x 5.43"
11.73" x 6.79" and 9.40" x 5.45"
7.80" x 4.52" and 6.85" x 3.98"